"Xinhai" redirects here. For other uses, see Xinhai (disambiguation). 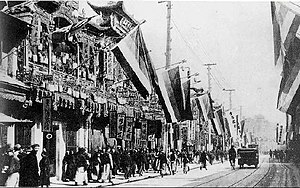 Double Ten Revolution in Shanghai- Nanjing Road (Nanking Road) after the Shanghai Uprising , hung with the Five Races Under One Union flags then used by the revolutionaries in Shanghai and Northern China. The Railway Protection Movement, also known as the "Railway Rights Protection Movement", was a political protest movement that erupted in 1911 in late Qing China against the Qing government's plan to nationalize local railway development projects and transfer control to foreign banks. The movement, centered in Sichuan province, expressed mass discontent with Qing rule, galvanized anti-Qing groups and contributed to the outbreak of the Xinhai Revolution. The mobilization of imperial troops from neighboring Hubei Province to suppress the Railway Protection Movement created the opportunity for revolutionaries in Wuhan to launch the Wuchang Uprising, which triggered the revolution that overthrew the Qing dynasty and established the Republic of China. The revolution arose mainly in response to the decline of the Qing state, which had proven ineffective in its efforts to modernize China and confront foreign aggression. Many underground anti-Qing groups, with the support of Chinese revolutionaries in exile, tried to overthrow the Qing. The brief civil war that ensued was ended through a political compromise between Yuan Shikai, the late Qing military strongman, and Sun Yat-sen, the leader of the Tongmenghui (United League). 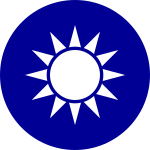 After the Qing court transferred power to the newly founded republic, a provisional coalition government was created along with the National Assembly. However, political power of the new national government in Beijing was soon thereafter monopolized by Yuan and led to decades of political division and warlordism, including several attempts at imperial restoration. Anti-Qing sentiment refers to a sentiment principally held in China against the Manchu ruling during the Qing dynasty (1644–1912), which was accused by a number of opponents of being barbarian. The Qing was accused of destroying traditional Han culture by forcing Han to wear their hair in a queue in the Manchu style. It was blamed for suppressing Chinese science, causing China to be transformed from the world's premiere power to a poor, backwards nation. The people of the Eight Banners lived off government pensions unlike the general Han civilian population. Sun Yat-sen was a Chinese politician, medical doctor and philosopher who served as the provisional first president of the Republic of China; and the first leader of the Kuomintang. He is referred to as the "Father of the Nation" in the Republic of China due to his role in the overthrow of the Qing dynasty during the Xinhai Revolution. Sun remains a unique figure among 20th-century Chinese characters for being widely revered in both mainland China and Taiwan. The Republic of China in Taiwan and the People's Republic of China on the mainland both consider themselves the legitimate successors to the Xinhai Revolution and honor the ideals of the revolution including nationalism, republicanism, modernization of China and national unity. 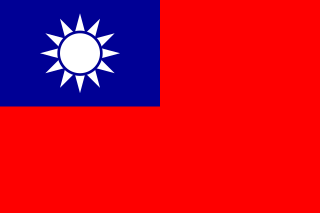 10 October is commemorated in Taiwan as Double Ten Day, the National Day of the ROC. In mainland China, Hong Kong, and Macau, the day is celebrated as the Anniversary of the Xinhai Revolution. The history of the People's Republic of China details the history of mainland China since October 1, 1949, when, after a near complete victory by the Communist Party of China (CPC) in the Chinese Civil War, Mao Zedong proclaimed the People's Republic of China (PRC) from atop Tiananmen. The PRC has for several decades been synonymous with China, but it is only the most recent political entity to govern mainland China, preceded by the Republic of China (ROC) and thousands of years of imperial dynasties. Empress Dowager Cixi (1835–1908), who personified the conservative Qing court and controlled court politics for 47 years, halted the attempt of her nephew, the Guangxu Emperor (1871–1908), the penultimate Qing emperor, to institute reforms in 1898. After the failure of the Hundred Days' Reform in 1898, Guangxu's advisors Kang Youwei (left, 1858–1927) and Liang Qichao (1873–1929) fled into exile, while Tan Sitong (right, 1865–1898) was executed. 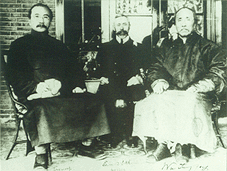 In Canada, Kang and Liang formed the Emperor Protection Society to promote a constitutional monarchy for China. In 1900, they supported an unsuccessful uprising in central China to rescue Guangxu. After the Xinhai Revolution, Liang became a Minister of Justice of the Republic of China. 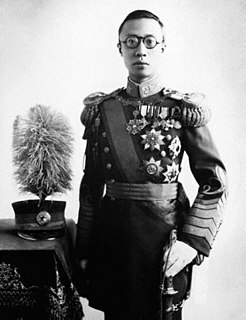 Kang remained a royalist and supported restoring the last Qing emperor Puyi in 1917. After suffering its first defeat to the West in the First Opium War in 1842, the Qing imperial court struggled to contain foreign intrusions into China. Efforts to adjust and reform the traditional methods of governance were constrained by a deeply conservative court culture that did not want to give away too much authority to reform. Following defeat in the Second Opium War in 1860, the Qing tried to modernize by adopting certain Western technologies through the Self-Strengthening Movement from 1861. In the wars against the Taiping (1851–64), Nian (1851–68), the Muslims of Yunnan (1856–68) and the Northwest (1862–77), the traditional imperial troops proved themselves incompetent and the court came to rely on local armies. In 1895, China suffered another defeat during the First Sino-Japanese War. This demonstrated that traditional Chinese feudal society also needed to be modernized if the technological and commercial advancements were to succeed. 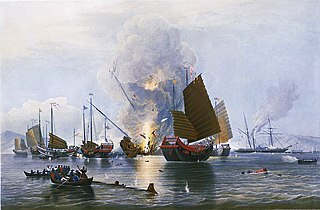 The First Opium War, also known as the Opium War or the Anglo-Chinese War, was a series of military engagements fought between the United Kingdom and the Qing dynasty of China over diplomatic relations, trade, and the administration of justice in China. The Second Opium War, the Second Anglo-Chinese War, the Second China War, the Arrow War, or the Anglo-French expedition to China, was a war pitting the United Kingdom and the French Empire against the Qing dynasty of China, lasting from 1856 to 1860. 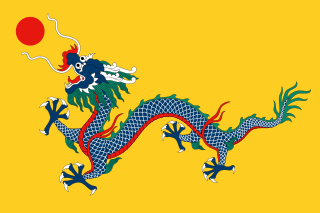 The Self-Strengthening Movement, also known as the Westernization or Western Affairs Movement or Tongzhi Reforms, c. 1861 – 1895, was a period of institutional reforms initiated in China during the late Qing dynasty following the military disasters of the Opium Wars against the British Empire and the vast internal devastation of the Taiping and other concurrent rebellions. In 1898 the Guangxu Emperor was guided by reformers like Kang Youwei and Liang Qichao for a drastic reform in education, military and economy under the Hundred Days' Reform. The reform was abruptly cancelled by a conservative coup led by Empress Dowager Cixi. The Guangxu Emperor, who had always been a puppet dependent on Cixi, was put under house arrest in June 1898. Reformers Kang and Liang would be exiled. While in Canada, in June 1899, they tried to form the Emperor Protection Society in an attempt to restore the emperor. Empress Dowager Cixi mainly controlled the Qing dynasty from this point on. The Boxer Rebellion prompted another foreign invasion of Beijing in 1900 and the imposition of unequal treaty terms, which carved away territories, created extraterritorial concessions and gave away trade privileges. Under internal and external pressure, the Qing court began to adopt some of the reforms. The Qing managed to maintain its monopoly on political power by suppressing, often with great brutality, all domestic rebellions. Dissidents could operate only in secret societies and underground organizations, in foreign concessions or in exile overseas. The Guangxu Emperor, personal name Zaitian, was the 11th emperor of the Qing dynasty, and the ninth Qing emperor to rule over China proper. His reign lasted from 1875 to 1908, but in practice he ruled, under Empress Dowager Cixi's influence, only from 1889 to 1898. He initiated the Hundred Days' Reform, but was abruptly stopped when the empress dowager launched a coup in 1898, after which he was put under house arrest until his death. His regnal name, "Guangxu", means "glorious succession". Kang Youwei was a Chinese scholar, noted calligrapher and prominent political thinker and reformer of the late Qing dynasty. Through his connections, he became close to the young Guangxu Emperor and fervently encouraged him to promote his friends and consequently soured the relationship between the emperor and his adoptive mother, the powerful Empress Dowager Cixi. His ideas inspired a reformation movement. Although he continued to advocate a constitutional monarchy after the founding of the Republic, Kang's political theory was never put into practice as he was forced to flee China for repeated attempts to assassinate the empress dowager. He was an ardent Chinese nationalist and internationalist. Liang Qichao, courtesy name Zhuoru, art name Rengong, was a Chinese scholar, journalist, philosopher, and reformist who lived during the late Qing dynasty and the early Republic of China. He inspired Chinese scholars with his writings and reform movements. 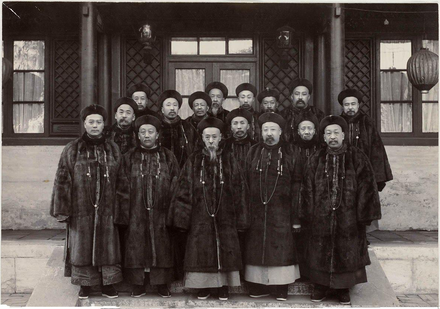 Gelaohui (Elder Brother society) was another group, with Zhu De, Wu Yuzhang, Liu Zhidan (劉志丹) and He Long. This is the revolutionary group that would eventually develop a strong link with the later Communist Party. In February 1906 Rizhihui (日知會) also had many revolutionaries, including Sun Wu (孫武), Zhang Nanxian (張難先), He Jiwei and Feng Mumin. A nucleus of attendees of this conference evolved into the Tongmenhui's establishment in Hubei. In July 1907 several members of Tongmenhui in Tokyo advocated a revolution in the area of the Yangtze River. Liu Quiyi (劉揆一), Jiao Dafeng (焦達峰), Zhang Boxiang (張伯祥) and Sun Wu (孫武) established Gongjinhui (Progressive Association) (共進會). In January 1911, the revolutionary group Zhengwu Xueshe (振武學社) was renamed as Wenxueshe (Literary society) (文學社). 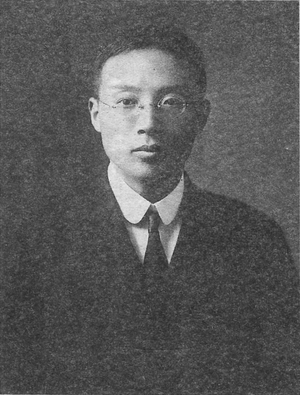 Jiang Yiwu (蔣翊武) was chosen as the leader. These two organizations would play a big role in the Wuchang Uprising. The Xinhai Revolution was supported by many groups, including students and intellectuals who returned from abroad, as well as participants of the revolutionary organizations, overseas Chinese, soldiers of the new army, local gentry, farmers and others. Yuan rose to power in north China and built the Beiyang Army. The far right wing Japanese ultra-nationalist Black Dragon Society supported Sun Yat-sen's activities against the Manchus, believing that overthrowing the Qing would help the Japanese take over the Manchu homeland and that Han Chinese would not oppose the take over. Toyama believed that the Japanese could easily take over Manchuria and Sun Yat-sen and other anti-Qing revolutionaries would not resist and help the Japanese take over and enlargen the opium trade in China while the Qing was trying to destroy the opium trade. The Japanese Black Dragons supported Sun Yat-sen and anti-Manchu revolutionaries until the Qing collapsed. 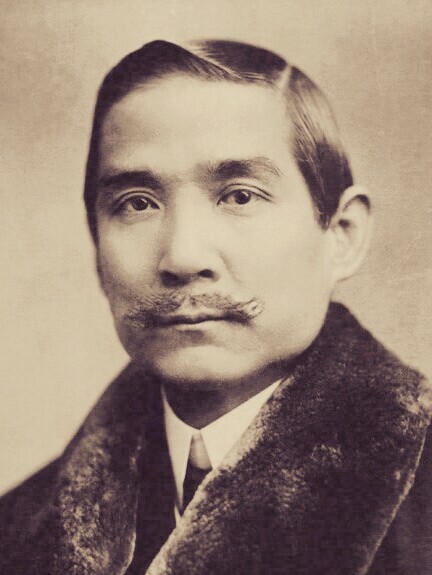 The far right wing Japanese ultranationalist Gen'yōsha leader Tōyama Mitsuru supported anti-Manchu, anti-Qing revolutionary activities including by Sun Yat-sen and supported Japanese taking over Manchuria. The anti-Qing Tongmenghui was founded and based in exile in Japan where many anti-Qing revolutionaries gathered. The Japanese had been trying to unite anti-Manchu groups made out of Han people to take down the Qing. Japanese were the ones who helped Sun Yat-sen unite all anti-Qing, anti-Manchu revolutionary groups together and there were Japanese like Tōten Miyazaki inside of the anti-Manchu Tongmenghui revolutionary alliance. The Black Dragon Society hosted the Tongmenghui in its first meeting. The Black Dragon Society had very intimate relations with Sun Yat-sen and promoted pan-Asianism and Sun sometimes passed himself off as Japanese. That had connections with Sun for a long time. Japanese groups like the Black Dragon Society had a large impact on Sun Yat-sen. According to an American military historian, Japanese military officers were part of the Black Dragon Society. The Yakuza and Black Dragon Society helped arrange in Tokyo for Sun Yat-sen to hold the first Kuomintang meetings, and were hoping to flood China with opium and overthrow the Qing and deceive Chinese into overthrowing the Qing to Japan's benefit. After the revolution was successful, the Japanese Black Dragons started infiltrating China and spreading opium. The Black Dragons pushed for the takeover of Manchuria by Japan in 1932. Sun Yat-sen was married to a Japanese, Kaoru Otsuki. The central focus of the uprisings were mostly connected with the Tongmenghui and Sun Yat-sen, including subgroups. Some uprisings involved groups that never merged with the Tongmenghui. Sun Yat-sen may have participated in 8–10 uprisings; all uprisings failed prior to the Wuchang Uprising. 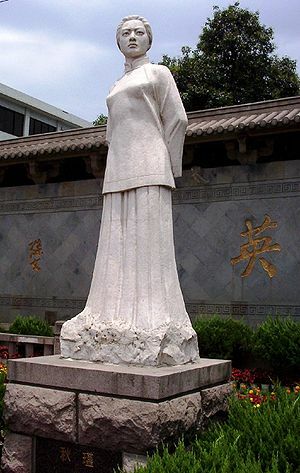 In the same year, Sun Yat-sen sent more revolutionaries to Huizhou to launch the "Huizhou Qinühu Uprising" (惠州七女湖起義). On 2 June, Deng Zhiyu (鄧子瑜) and Chen Chuan (陳純) gathered some followers, and together, they seized Qing arms in the lake, 20 km (12 mi) from Huizhou. 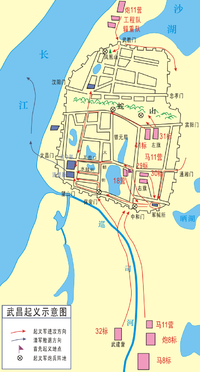 They killed several Qing soldiers and attacked Taiwei (泰尾) on 5 June. The Qing army fled in disorder, and the revolutionaries exploited the opportunity, capturing several towns. They defeated the Qing army once again in Bazhiyie. 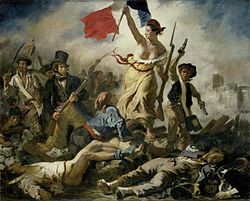 Many organizations voiced their support after the uprising, and the number of revolutionary forces increased to two hundred men at its height. The uprising, however, ultimately failed. From August to September 1907, the Qinzhou Uprising occurred (欽州防城起義).,  to protest against heavy taxation from the government. Sun Yat-sen sent Wang Heshun (王和順) there to assist the revolutionary army and captured the county in September. After that, they attempted to besiege and capture Qinzhou, but they were unsuccessful. They eventually retreated to the area of Shiwandashan, while Wang Heshun returned to Vietnam. On 1 December 1907, the Zhennanguan Uprising (鎮南關起事) took place at Zhennanguan, a pass on the Chinese-Vietnamese border. 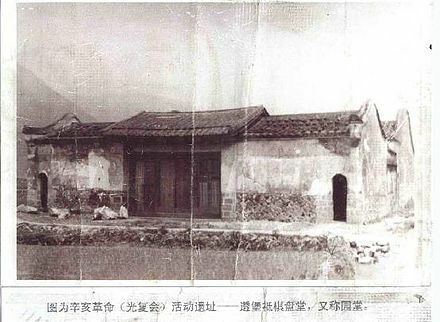 Sun Yat-sen sent Huang Mintang (黃明堂) to monitor the pass, which was guarded by a fort. 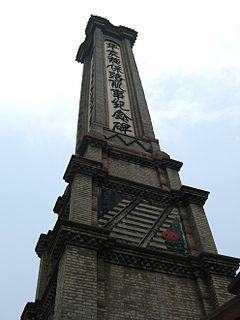 With the assistance of supporters among the fort's defenders, the revolutionaries captured the cannon tower in Zhennanguan. Sun Yat-sen, Huang Xing and Hu Hanmin personally went to the tower to command the battle. The Qing government sent troops led by Long Jiguang and Lu Rongting to counterattack, and the revolutionaries were forced to retreat into the mountainous areas. After the failure of this uprising, Sun was forced to move to Singapore due to anti-Sun sentiments within the revolutionary groups. He would not return to the mainland until after the Wuchang Uprising. On 19 November 1908, the Mapaoying Uprising (馬炮營起義) was launched by revolutionary group Yuewanghui (岳王會) member Xiong Chenggei (熊成基) at Anhui. Yuewanghui, at this time, was a subset of Tongmenghui. This uprising also failed. 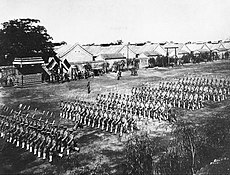 In February 1910, the Gengxu New Army Uprising (庚戌新軍起義), also known as the Guangzhou New Army Uprising (廣州新軍起義), took place. This involved a conflict between the citizens and local police against the New Army. After revolutionary leader Ni Yingdian was killed by Qing forces, the remaining revolutionaries were quickly defeated, causing the uprising to fail. The Literary Society (文學社) and the Progressive Association (共進會) were revolutionary organizations involved in the uprising that mainly began with a Railway Protection Movement protest. In the late summer, some Hubei New Army units were ordered to neighboring Sichuan to quell the Railway Protection Movement, a mass protest against the Qing government's seizure and handover of local railway development ventures to foreign powers. Banner officers like Duanfang, the railroad superintendent,  and Zhao Erfeng led the New Army against the Railway Protection Movement. The New Army units of Hubei had originally been the Hubei Army, which had been trained by Qing official Zhang Zhidong. On 24 September, the Literary Society and Progressive Association convened a conference in Wuchang, along with sixty representatives from local New Army units. During the conference, they established a headquarters for the uprising. The leaders of the two organizations, Jiang Yiwu (蔣翊武) and Sun Wu (孫武), were elected as commander and chief of staff. Initially, the date of the uprising was to be 6 October 1911. It was postponed to a later date due to insufficient preparations. 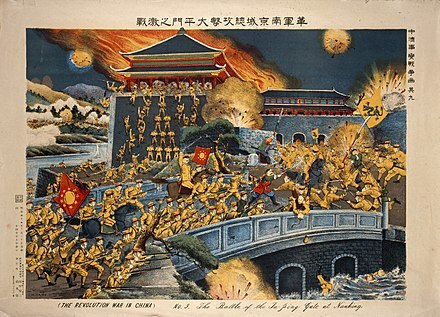 Revolutionaries intent on overthrowing the Qing dynasty had built bombs, and on 9 October, one accidentally exploded. Sun Yat-sen himself had no direct part in the uprising and was traveling in the United States at the time in an effort to recruit more support from among overseas Chinese. The Qing Viceroy of Huguang, Rui Cheng (瑞澂), tried to track down and arrest the revolutionaries. Squad leader Xiong Bingkun (熊秉坤) and others decided not to delay the uprising any longer and launched the revolt on 10 October 1911, at 7 pm. The revolt was a success; the entire city of Wuchang was captured by the revolutionaries on the morning of 11 October. That evening, they established a tactical headquarters and announced the establishment of the "Military Government of Hubei of Republic of China". The conference chose Li Yuanhong as the governor of the temporary government. Qing officers like the bannermen Duanfang and Zhao Erfeng were killed by the revolutionary forces. After the success of the Wuchang Uprising, many other protests occurred throughout the country for various reasons. Some of the uprisings declared restoration (光復) of the Han Chinese rule. Other uprisings were a step toward independence, and some were protests or rebellions against the local authorities. [ citation needed ] Regardless the reason for the uprising the outcome was that all provinces in the country renounced the Qing dynasty and joined the ROC. The Xinhai rebels in Taiyuan bombarded the streets where banner people resided and killed all the Manchu. They managed to kill the Qing Governor of Shanxi, Lu Zhongqi (陸鍾琦). They then announced the establishment of Shanxi Military Government with Yan Xishan as the military governor. Yan Xishan would later become one of the warlords that plagued China during what was known as "the warlord era". 1911 battle at Ta-ping gate, Nanking. Painting by T. Miyano. At the end of 1911, the Mongols took action with an armed revolt against the Manchu authorities but were unsuccessful in the attempt. An independence movement took place that was not limited to just North (outer) Mongolia but was a pan-Mongolian phenomenon. On 29 December 1911, Bogd Khan became the leader of the Mongol empire. Inner Mongolia became a contested terrain between Khan and the Republic. In general, Russia supported the Independence of Outer Mongolia (including Tannu Uriankhai) during the time of the Xinhai Revolution. Tibet and Mongolia then recognized each other in a treaty. On 1 November 1911, the Qing government appointed Yuan Shikai as the prime minister of the imperial cabinet, replacing Prince Qing. 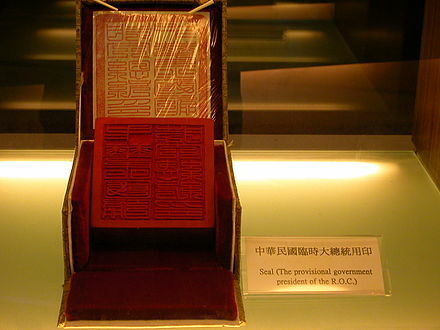 On 3 November, after a proposition by Cen Chunxuan from the Constitutional Monarchy Movement (立憲運動), in 1903, the Qing court passed the Nineteen Articles (憲法重大信條十九條), which turned the Qing from an autocratic system with the emperor having unlimited power to a constitutional monarchy. On 9 November, Huang Xing even cabled Yuan Shikai and invited him to join the Republic. The court changes were too late, and the emperor was about to have to step down. On 28 November 1911, Wuchang and Hanyang had fallen back to the Qing army. So for safety, the revolutionaries convened their first conference at the British concession in Hankou on 30 November. By 2 December, the revolutionary forces were able to capture Nanking in the uprising; the revolutionaries decided to make it the site of the new provisional government. At the time, Beijing was still the Qing capital. Tang Shaoyi, left. Edward Selby Little, middle. Wu Tingfang, right. On 16 January, while returning to his residence, Yuan Shikai was ambushed in a bomb attack organized by the Tongmenghui in Donghuamen (東華門), Beijing. A total of eighteen revolutionaries were involved. About ten of the guards died, but Yuan himself was not seriously injured. He sent a message to the revolutionaries the next day pledging his loyalty and asking them not to organize any more assassination attempts against him. Zhang Jian drafted an abdication proposal that was approved by the Provisional Senate. 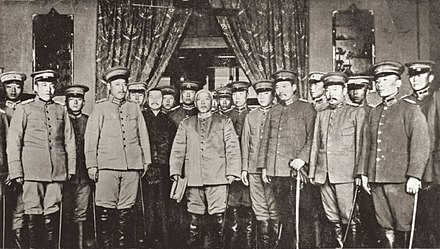 On 20 January, Wu Tingfang of the Nanking Provisional government officially delivered the imperial edict of abdication to Yuan Shikai for the abdication of Puyi. On 22 January, Sun Yat-sen announced that he would resign the presidency in favor of Yuan Shikai if the latter supported the emperor's abdication. Yuan then pressured Empress Dowager Longyu with the threat that the lives of the imperial family would not be spared if abdication did not come before the revolutionaries reached Beijing, but if they agreed to abdicate, the provisional government would honor the terms proposed by the imperial family. 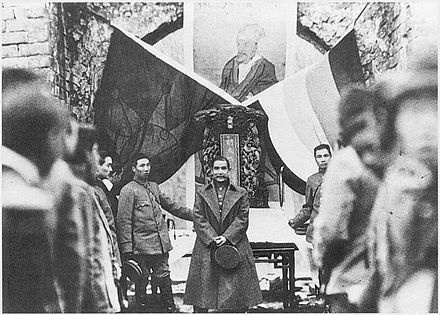 As a condition for ceding leadership to Yuan Shikai, Sun Yat-sen insisted that the provisional government remain in Nanjing. On 14 February, the Provisional Senate initially voted 20–5 in favor of making Beijing the capital over Nanjing, with two votes going for Wuhan and one for Tianjin. The Senate majority wanted to secure the peace agreement by taking power in Beijing. Zhang Jian and others reasoned that having the capital in Beijing would check against Manchu restoration and Mongol secession. But Sun and Huang Xing argued in favor of Nanjing to balance against Yuan's power base in the north. Li Yuanhong presented Wuhan as a compromise. The next day, the Provisional Senate voted again, this time, 19-6 in favor of Nanjing with two votes for Wuhan. Sun sent a delegation led by Cai Yuanpei and Wang Jingwei to persuade Yuan to move to Nanjing. Yuan welcomed the delegation and agreed to accompany the delegates back to the south. Then on the evening of 29 February, riots and fires broke out all over the city. They were allegedly started by disobedient troops of Cao Kun, a loyal officer of Yuan. The disorder gave Yuan the pretext to stay in the north to guard against unrest. On 10 March, Yuan was inaugurated in Beijing as the provisional president of the Republic of China. On 5 April, the Provisional Senate in Nanjing voted to make Beijing the capital of the Republic and convened in Beijing at the end of the month. The Han hereditary aristocratic nobility like the Duke Yansheng, Marquis of Extended Grace, and the title of the Wujing Boshi (changed to "Dacheng Zhisheng Xianshi Nanzong Fengsi Guan" 大成至聖先師南宗奉祀官) and the titles held by the descendants of Mencius, Zengzi, and Yan Hui were retained by the new Republic of China and the title holders continued to receive their pensions. ^ a: Many of the Qing soldiers with Han background turned to support the revolution during the uprisings, so the actual casualties are hard to trace. ^ b: Clipping from Min Bao (People's Papers). Originally the publishing of Hua Xin Hui and named China of the Twentieth Century, it was renamed after the establishment of Tongmenhui. 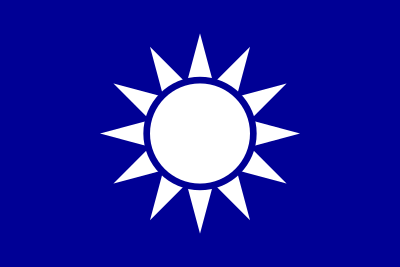 The Tongmenghui was a secret society and underground resistance movement founded by Sun Yat-sen, Song Jiaoren, and others in Tokyo, Japan, on 20 August 1905. 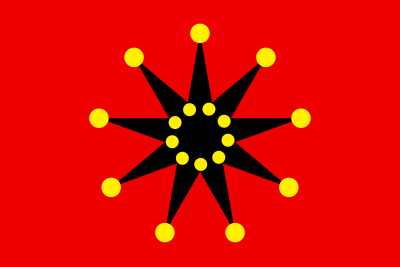 It was formed from the merger of many Chinese revolutionary groups in the late Qing dynasty. Dai Jitao or Tai Chi-t'ao was a Chinese journalist, an early Kuomintang member, and the first head of the Examination Yuan of the Republic of China. He is often referred to as Dai Chuanxian or by his other courtesy name, Dai Xuantang. Huang Xing or Huang Hsing was a Chinese revolutionary leader and politician, and the first army commander-in-chief of the Republic of China. As one of the founders of the Kuomintang (KMT) and the Republic of China, his position was second only to Sun Yat-sen. Together they were known as Sun-Huang during the Xinhai Revolution. He was also known as the "Eight Fingered General" because of wounds sustained during war. His tomb is on Mount Yuelu, in Changsha, Hunan, China. Anti-Manchuism refers to sentiment in China held against Manchus, especially against the Qing Dynasty, which was often resented for being foreign, despite a degree of cultural integration. This ethnic-based sentiment tended to be a subset of the greater anti-Qing sentiment. Some of the anti-Manchuists in the Qing dynasty stated "Fan qing fu ming" to say they want to rebuild the Ming dynasty and overthrow the Qing dynasty. Sun Yat-sen along with Tong Meng Hui were not all that successful in holding revolutionary activities in Malaya, which consists of present-day Peninsular Malaysia and Singapore. The British colonial government maintained diplomatic relations with the Qing Government from the point of view of national relations, and the Qing embassies in Singapore and Penang became obstructions for the revolutionary activities. On the other side, the diplomats of the Qing Government visited areas of Malaya, and were welcomed by the local Chinese residents. These diplomats lobbied for local Chinese loyalty to the Qing Government; some of them sold government positions to achieve these goals. Hu Hanmin described the Chinese in the Southeast Asia as "Anyone that had some sort of official positions under the Manchus can go to Southeast Asia and bluff, saying "The three generations of my family were all first-grade officials, and I'm also a significant official with luxurious government headgear! ", and these bluffs will create a sensation in the local Chinese to adore you. From Hu Hanmin's description, it is apparent that the Chinese in Malaya were still influenced by conservative ideas. These conservative ideas helped the royalists led by Kang Youwei to win responses from the local Chinese residents. The Second Guangzhou Uprising, known in Chinese as the Yellow Flower Mound Uprising or the Guangzhou Xinhai Uprising, was a failed uprising led by Huang Xing and his fellow revolutionaries against the Qing Dynasty in Guangzhou. 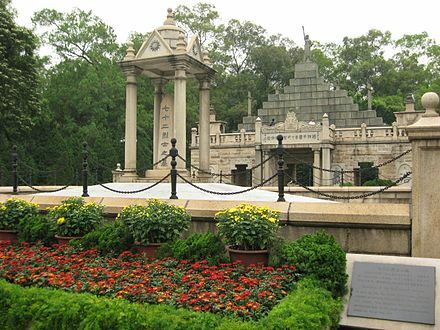 It is honored in Guangzhou's Yellow Flower Mound or Huanghuagang Park. The 100th anniversary of the founding of the Republic of China began on 10 October 2011 on the 100th anniversary of the Xinhai Revolution. It was celebrated in Taiwan and mainland China, but the connotation and significance of the celebration varied by region. 1911, also known as Xinhai Revolution and The 1911 Revolution, is a 2011 Chinese historical drama film. The film is a tribute to the 100th anniversary of the Xinhai Revolution. It is also Jackie Chan's 100th film in his career. Besides starring in it, Chan is also the executive producer and co-director of the film. Co-stars include Chan's son Jaycee Chan, Li Bingbing, Winston Chao, Joan Chen and Hu Ge. This film was selected to open the 24th Tokyo International Film Festival. The Provisional Government of the Republic of China was a provisional government established during the Xinhai Revolution by the revolutionaries in 1912. After the success of the Wuchang uprising, revolutionary provincial assembly representatives held a conference in the district of Wuchang, China, which framed the organizational outline of the Provisional Government. The Battle of Yangxia, also known as the Defense of Yangxia, was the largest military engagement of the Xinhai Revolution and was fought from October 18-December 1, 1911, between the revolutionaries of the Wuchang Uprising and the loyalist armies of the Qing Dynasty. The battle was waged in Hankou and Hanyang, which along with Wuchang collectively form the tri-cities of Wuhan in central China. Though outnumbered by the Qing armies and possessing inferior arms, the revolutionaries fought valiantly in defense of Hankou and Hanyang. 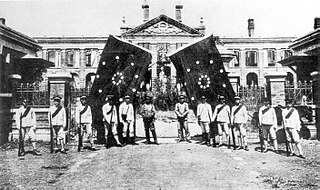 After heavy and bloody fighting, the stronger loyalist forces eventually prevailed by taking over both cities, but 41 days of determined resistance by the Revolutionary Army allowed the revolution to strengthen elsewhere as other provinces defied the Qing Dynasty. The fighting ended after the commander-in-chief of the Qing forces, Gen. Yuan Shikai, agreed to a cease-fire and sent envoys to peace talks with the revolutionaries. Political negotiations eventually led to the abdication of the Last Emperor, the end of the Qing Dynasty and the formation of a unity government for the newly established Republic of China. 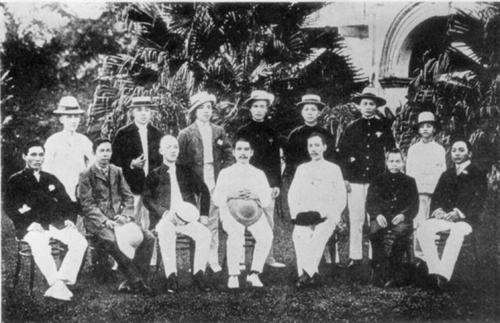 The 1910 Penang conference (庇能會議) was a meeting held in Penang 404 Dato' Kramat road on November 13, 1910, by Sun Yat-sen to stage a major revolt. The following day, on November 14, 1910, Sun Yat-sen chaired an Emergency Meeting of the Tongmenghui at 120 Armenian Street, now the Sun Yat Sen Museum Penang, and raised Straits Dollars $8,000 on the spot. The meeting focused on fund raising and the planning of a final revolution to overthrow the Qing government that would make or break the Tongmenghui. Yau Lit (尢列), born Yau Kwai-bok (尢季博), courtesy name Tui-hau (推孝) or Ling-kwai (令季), was a Chinese revolutionary from Shuntak, Kwangtung. He is one of the Four Bandits, together with Sun Yat-sen, Chan siu-bak and Yeung Hok-ling. 1911 Revolution is a Chinese television series based on the events of the Xinhai Revolution, which brought an end to imperial rule in China in 1911. It was first broadcast on CCTV-1 during prime time on 27 September 2011. It was specially produced to mark the 100th anniversary of the Xinhai Revolution. The 1912 Republic of China Provisional Presidential and Vice-Presidential Elections were the elections held on 15 February and 20 February 1912 in Nanjing for the second provisional President and Vice President of the Republic of China respectively. ↑ Kit-ching (1978), pp. 49–52. 1 2 3 Li, Xiaobing. (2007). A History of the Modern Chinese Army. University Press of Kentucky. ISBN 0-8131-2438-7, ISBN 978-0-8131-2438-4. pg 13. pg 26–27. 1 2 3 Wang, Ke-wen. (1998). Modern China: An Encyclopedia of History, Culture, and Nationalism. Taylor & Francis publishing. ISBN 0-8153-0720-9, ISBN 978-0-8153-0720-4. pg 106. pg 344. 1 2 Bevir, Mark. (2010). Encyclopedia of Political Theory. Sage Publishing. ISBN 1-4129-5865-2, ISBN 978-1-4129-5865-3. pg 168. ↑ South China morning post. 29 March 2011. Hong Kong played a key role in the life of Sun Yat-sen.
↑ Curthoys, Ann. Lake, Marilyn. (2005). Connected Worlds: History in Transnational Perspective. ANU Publishing. ISBN 1-920942-44-0, ISBN 978-1-920942-44-1. pg 101. ↑ Platt, Stephen R.  (2007). Provincial Patriots: The Hunanese and Modern China. Harvard University Press. ISBN 0-674-02665-9, ISBN 978-0-674-02665-0. pg 128. ↑ Goossaert, Vincent. Palmer, David A. (2011). The Religious Question in Modern China. University of Chicago Press. ISBN 0-226-30416-7, ISBN 978-0-226-30416-8. 1 2 3 Wang, Ke-wen. (1998). Modern China: An Encyclopedia of History, Culture, and Nationalism. Taylor & Francis Publishing. ISBN 0-8153-0720-9, ISBN 978-0-8153-0720-4. pg 287. ↑ 中国人民大学. 书报资料中心. (1982). 中国近代史, Issues 1–6. 中国人民大学书报资料社 publishing. University of California Press. ↑ Chen, Lifu. Chang, Hsu-hsin. Myers, Ramon Hawley. (1994). The Storm Clouds Clear Over China: The Memoir of Chʻen Li-fu, 1900–1993. Hoover Press. ISBN 0-8179-9272-3, ISBN 978-0-8179-9272-9. ↑ João de Pina-Cabral. (2002). Between China and Europe: Person, Culture and Emotion in Macao. Berg Publishing. ISBN 0-8264-5749-5, ISBN 978-0-8264-5749-3. pg 209. ↑ 陳民, 中國社會科學院. 中華民國史研究室. (1981). 中國致公黨. 文史資料出版社. Digitized University of California 10 December 2007. 1 2 計秋楓, 朱慶葆. (2001). 中國近代史, V. 1. Chinese University Press. ISBN 962-201-987-0, ISBN 978-962-201-987-4. pg 468. ↑ Etō, Shinkichi. Schiffrin, Harold Z. (2008). China's Republican Revolution. University of Tokyo Press. Digitized 10 September 2008. ISBN 4-13-027030-3, ISBN 978-4-13-027030-4. ↑ 为君丘, 張運宗. (2003). 走入近代中國. 五南圖書出版股份有限公司. ISBN 957-11-3175-X, 9789571131757. ↑ 蔣緯國. (1981). 建立民國, Volume 2. 國民革命戰史: 第1部. 黎明文化事業公司. University of California. Digitized 14 February 2011. ↑ 饒懷民. (2006). 辛亥革命與清末民初社會/中國近代史事論叢. 中華書局 publishing. ISBN 7-101-05156-1, ISBN 978-7-101-05156-8. 1 2 Wang, Ke-wen. (1998). Modern China: An Encyclopedia of History, Culture, and Nationalism. Taylor & Francis Publishing. ISBN 0-8153-0720-9, ISBN 978-0-8153-0720-4. pp. 390–391. ↑ 蔡登山. 繁華落盡──洋場才子與小報文人. 秀威資訊科技股份有限公司. ISBN 986-221-826-6, ISBN 978-986-221-826-6. pg 42. ↑ Scalapino, Robert A. and George T. Yu (1961). The Chinese Anarchist Movement. Berkeley: Center for Chinese Studies, Institute of International Studies, University of California. At The Anarchist Library (Free Download). The online version is unpaginated. ↑ 楊碧玉. 洪秀全政治人格之研究. 秀威資訊科技股份有限公司 Publishing. ISBN 986-221-141-5, ISBN 978-986-221-141-0. ↑ Crossley, Pamela Kyle. (1991). Orphan Warriors: Three Manchu Generations and the End of the Qing World. Princeton University Press. ISBN 0-691-00877-9, ISBN 978-0-691-00877-6. pg180-181. ↑ Lee, Khoon Choy Lee. (2005). Pioneers of Modern China: Understanding the Inscrutable Chinese. World Scientific. ISBN 981-256-618-X, 9789812566188. 1 2 3 Gao, James Zheng. (2009). Historical Dictionary of Modern China (1800–1949). Issue 25 of "Historical Dictionaries of Ancient Civilizations and Historical Eras". Scarecrow Press. ISBN 0-8108-4930-5, ISBN 978-0-8108-4930-3. pg 156. pg 29. 1 2 3 4 5 Fenby, Jonathan. (2008). The History of Modern China: The Fall and Rise of a Great Power. ISBN 978-0-7139-9832-0. pg 96. pg 106. ↑ Fenby, Jonathan. (2008). The History of Modern China: The Fall and Rise of a Great Power. ISBN 978-0-7139-9832-0. pg 109. ↑ Rhoads, Edward J. M.  (2000). Manchus & Han: Ethnic Relations and Political Power in Late Qing and Early Republican China, 1861–1928. University of Washington Press. ISBN 0-295-98040-0, ISBN 978-0-295-98040-9. pg21. ↑ Wang, Ke-wen. (1998). Modern China: An Encyclopedia of History, Culture, and Nationalism. Taylor & Francis Publishing. ISBN 0-8153-0720-9, ISBN 978-0-8153-0720-4. Pg 76. ↑ Kaplan, Lawrence M. (2010). Homer Lea American Soldier of Fortune. Lexington: University Press of Kentucky. ISBN 978-0813126173. 1 2 Lau, Kit-ching Chan. (1990). China, Britain and Hong Kong, 1895–1945. Chinese University Press. ISBN 962-201-409-7, ISBN 978-962-201-409-1. p. 37. ↑ Borst-Smith, Ernest F. (1912). Caught in the Chinese Revolution. T Fisher Unwin. ↑ Jay Robert Nash (1997-10-28). Spies: A Narrative Encyclopedia of Dirty Tricks and Double Dealing from Biblical Times to Today. M. Evans. pp. 99–. ISBN 978-1-4617-4770-3. ↑ Marie-Claire Bergère; Janet Lloyd (1998). Sun Yat-sen. Stanford University Press. pp. 132–. ISBN 978-0-8047-4011-1. ↑ Gerald Horne (November 2005). Race War! : White Supremacy and the Japanese Attack on the British Empire. NYU Press. pp. 252–. ISBN 978-0-8147-3641-8. ↑ Dooeum Chung (2000). Élitist fascism: Chiang Kaishek's Blueshirts in 1930s China. Ashgate. p. 61. ISBN 978-0-7546-1166-0. ↑ Dooeum Chung (1997). A re-evaluation of Chiang Kaishek's blueshirts: Chinese fascism in the 1930s. University of London. p. 78. ↑ Rodney Carlisle (2015-03-26). Encyclopedia of Intelligence and Counterintelligence. Routledge. pp. 71–. ISBN 978-1-317-47177-6. ↑ Spence, Jonathan D.  (1990). The Search for Modern China. W. W. Norton & Company Publishing. ISBN 0-393-30780-8, ISBN 978-0-393-30780-1. pp. 250–256. 1 2 計秋楓, 朱慶葆. (2001). 中國近代史, Volume 1. Chinese University Press. ISBN 962-201-987-0, ISBN 978-962-201-987-4. p. 464. 1 2 South China morning post. 6 April 2011. Waiting may be over at grave of an unsung hero. 1 2 Wang, Ke-wen. (1998). Modern China: an encyclopedia of history, culture, and nationalism. Taylor & Francis Publishing. ISBN 0-8153-0720-9, ISBN 978-0-8153-0720-4. p. 424. ↑ Gao, James Zheng. (2009). Historical dictionary of modern China (1800–1949). Scarecrow Press. ISBN 0-8108-4930-5, ISBN 978-0-8108-4930-3. Chronology section. ↑ 陳錫祺. (1991). 孫中山年谱長編 volume 1. 中华书局. ISBN 7-101-00685-X, ISBN 9787101006858. ↑ 申友良. (2002). 报王黃世仲. 中囯社会科学出版社 publishing. ISBN 7-5004-3309-3, ISBN 978-7-5004-3309-5. 1 2 Joan Judge. (1996). Print and politics: 'Shibao' and the culture of reform in late Qing China. Stanford University Press. ISBN 0-8047-2741-4, ISBN 978-0-8047-2741-9. p. 214. ↑ 清宮藏辛亥革命檔案公佈 清廷密追孫中山(圖)-新聞中心_中華網. China.com (in Chinese). Retrieved 2011-10-16. 1 2 3 張家鳳. (2010). 中山先生與國際人士. Volume 1. 秀威資訊科技股份有限公司. ISBN 986-221-510-0, ISBN 978-986-221-510-4. p. 195. ↑ "宝鸡新闻网——荟集宝鸡新闻". Baojinews.com. 27 May 2011. Retrieved 2011-10-16. ↑ 張豈之, 陳振江, 江沛. (2002). 晚淸民國史. Volume 5 of 中國歷史. 五南圖書出版股份有限公司 publishing. ISBN 957-11-2898-8, ISBN 978-957-11-2898-6. p. 177. 1 2 中国二十世紀通鉴编辑委员会. (2002). 中国二十世紀通鉴, 1901–2000, Volume 1. 线装書局. 1 2 3 Lu Xun. Nadolny, Kevin John. (2009). Capturing Chinese: Short Stories from Lu Xun's Nahan. Capturing Chinese publishing. ISBN 0-9842762-0-3, ISBN 978-0-9842762-0-2. p. 51. ↑ 鄭連根. (2009). 故紙眉批── 一個傳媒人的讀史心得. 秀威資訊科技股份有限公司 publishing. ISBN 986-221-190-3, ISBN 978-986-221-190-8. p. 135. 1 2 3 辛亥革命武昌起義紀念館. (1991). 辛亥革命史地圖集. 中國地圖出版社 publishing. ↑ 中華民國史硏究室. (1986). 中華民國史資料叢稿: 譯稿. Volumes 1–2 of 中華民國史資料叢稿. published by 中華書局. ↑ Yan, Qinghuang. (2008). The Chinese in Southeast Asia and Beyond: Socioeconomic and Political Dimensions. World Scientific Publishing. ISBN 981-279-047-0, ISBN 978-981-279-047-7. pp. 182–187. ↑ 廣西壯族自治區地方誌編纂委員會. (1994). 廣西通志: 軍事志. 廣西人民出版社 publishing. Digitized University of Michigan. 26 October 2009. ↑ 中国百科年鉴. (1982). 中国大百科全书出版社. University of California. Digitized 18 December 2008. ↑ 汪贵胜, 许祖范. Compiled by 程必定. (1989). 安徽近代经济史. 黄山书社. Digitized by the University of Michigan. 31 October 2007. ↑ 张新民. (1993). 中国人权辞书. 海南出版社 publishing. Digitized by University of Michigan. 9 October 2009. 1 2 王恆偉. (2005) (2006) 中國歷史講堂 No. 5 清. 中華書局. ISBN 962-8885-28-6. p 195-198. 1 2 Langmead, Donald. (2011). Maya Lin: A Biography. ABC-CLIO Publishing. ISBN 0-313-37853-3, ISBN 978-0-313-37853-9. pp. 5–6. ↑ "Lin Jue Min's "Letter of Farewell to My Wife" — My translation". 15 November 2009. ↑ Reilly, Thomas. (1997). Science and Football III, Volume 3. Taylor & Francis publishing. ISBN 0-419-22160-3, ISBN 978-0-419-22160-9. pp. 105–106, 277–278. 1 2 王恆偉. (2005) (2006) 中國歷史講堂 No. 6 民國. 中華書局. ISBN 962-8885-29-4. pp. 3–7. 1 2 3 4 戴逸, 龔書鐸. (2003) 中國通史. 清. Intelligence Press. ISBN 962-8792-89-X. pp. 86–89. 1 2 3 4 5 张创新. (2005). 中国政治制度史. 2nd Edition. Tsinghua University Press. ISBN 7-302-10146-9, ISBN 978-7-302-10146-8. p. 377. 1 2 3 4 5 6 7 8 9 10 11 12 13 14 "武昌起義之後各省響應與國際調停 _新華網湖北頻道". xinhuanet.com. Retrieved 2011-10-16. 1 2 Jonathan Neaman Lipman (2004). Familiar Strangers: A History of Muslims in Northwest China. Seattle: University of Washington Press. p. 170. ISBN 978-0-295-97644-0 . Retrieved 28 June 2010. 1 2 Rhoads, Edward J. M.  (2000). Manchus & Han: Ethnic Relations and Political Power in Late Qing and Early Republican China, 1861–1928. University of Washington publishing. ISBN 0-295-98040-0, ISBN 978-0-295-98040-9. pg 192. ↑ Edward J. M. Rhoads (2000). Manchus and Han: Ethnic Relations and Political Power in Late Qing and Early Republican China, 1861–1928. University of Washington. p. 190. ISBN 9780295980409. 1 2 3 4 5 6 7 8 9 10 11 12 13 伍立杨. (2011). 中国1911 (辛亥年). ISBN 978-7-5313-3869-7, ISBN 7-5313-3869-6. Chapter 连锁反应 各省独立. ↑ 蒋顺兴, 李良玉. (1990). 山西王阎锡山/中华民国史丛书. Edition reprint. 河南人民出版社, 1990. ↑ Remote Homeland, Recovered Borderland: Manchus, Manchoukuo, and Manchuria, 1907-1985. p. 102. ↑ "山西辛亥革命官僚階層——巡撫陸鍾琦之死_辛亥革命前奏_辛亥革命网". Big5.xhgmw.org. Retrieved 2011-10-16. ↑ 中共湖南省委員會. (1981). 新湘評論, Issues 7–12. 新湘評論雜誌社. ↑ ""四大家族"后人:蒋家凋零落寞 宋、孔、陈家低调". Chinanews.com.cn. Retrieved 2011-10-16. ↑ 张玉法, 中央硏究院. 近代史硏究所. (1985). 民国初年的政党. 中央硏究院近代史硏究所 Publishing. ↑ "辛亥百年蘇州光復 一根竹竿挑瓦革命". Big5.xinhuanet.com. Retrieved 2011-10-16. 1 2 3 4 Rhoads, Edward J. M.  (2000). Manchus & Han: Ethnic Relations and Political Power in Late Qing and Early Republican China, 1861–1928. University of Washington Press. ISBN 0-295-98040-0, ISBN 978-0-295-98040-9. pg 194. ↑ "辛亥革命大事記_時政頻道_新華網". Big5.xinhuanet.com. Retrieved 2011-11-17. ↑ 國立臺灣師範大學. 歷史學系. (2003). Bulletin of historical research, Issue 31. 國立臺灣師範大學歷史學系 publishing. ↑ Lary, Diana. (2010). Warlord Soldiers: Chinese Common Soldiers 1911–1937. Cambridge University Press. ISBN 0-521-13629-6, ISBN 978-0-521-13629-7. pg 64. ↑ Howard L. Boorman; Richard C. Howard; Joseph K. H. Cheng (1967). Biographical Dictionary of Republican China. Columbia University Press. pp. 51–. ISBN 978-0-231-08957-9. 1 2 3 国祁李. (1990). 民国史论集, Volume 2. 南天書局 publishing. ↑  (1979). 傳記文學, Volume 34. 傳記文學雜誌社 Publishing. University of Wisconsin – Madison. Digitized 11 April 2011. ↑ 鄧之誠. (1983). 中華二千年史, Volume 5, Part 3, Issue 1. 中華書局. ISBN 7-101-00390-7, ISBN 978-7-101-00390-1. ↑ 广东省中山图书馆. (2002). 民国广东大事记. 羊城晚报出版社 Publishing. ISBN 7-80651-206-3, ISBN 978-7-80651-206-7. 1 2 徐博东, 黄志萍. (1987). 丘逢甲傳. 秀威資訊科技股份有限公司 publishing. ISBN 986-221-636-0, ISBN 978-986-221-636-1. pg 175. ↑ 居正, 羅福惠, 蕭怡. (1989). 居正文集, Volume 1. 華中師範大學出版社 publishing. Digitized by University of California. 15 December 2008. ↑ Travels of a Consular Officer in North-West China. CUP Archive. p. 188. Retrieved 28 June 2010. ↑ Jonathan Neaman Lipman (2004). Familiar Strangers: A History of Muslims in Northwest China. Seattle: University of Washington Press. pp. 182, 183. ISBN 978-0-295-97644-0 . Retrieved 28 June 2010. ↑ 粟戡时, 同明, 志盛, 雪云. (1981). 湖南反正追记. 湖南人民出版社. ↑ 辛亥革命史地圖集. (1991). 辛亥革命武昌起義紀念館. 中國地圖出版社. ↑ 中國地圖出版社. (1991). 辛亥革命史地圖集. 中國地圖出版社 publishing. 1 2 Rhoads, Edward J. M.  (2000). Manchus & Han: Ethnic Relations and Political Power in Late Qing and Early Republican China, 1861–1928. University of Washington Publishing. ISBN 0-295-98040-0, ISBN 978-0-295-98040-9. pg 198. 1 2 Blondeau, Anne-Marie. Buffetrille, Katia. Jing, Wei. (2008). Authenticating Tibet: Answers to China's 100 Questions. University of California Press. ISBN 0-520-24464-8, ISBN 978-0-520-24464-1. pg 230. ↑ Grunfeld, A. Tom. (1996). The Making of Modern Tibet Edition 2. M.E. Sharpe Publishing. ISBN 1-56324-714-3, ISBN 978-1-56324-714-9. pg 63. ↑ Rong, Ma. (2010). Population and Society in Tibet. Hong Kong University Press. ISBN 962-209-202-0, ISBN 978-962-209-202-0. pg 48. 1 2 3 Mayhew, Bradley and Michael Kohn. (2005). Tibet, p. 32. Lonely Planet Publications. ISBN 1-74059-523-8. 1 2 Onon, Urgunge Onon. Pritchatt, Derrick. (1989). Asia's first modern revolution: Mongolia proclaims its independence in 1911. BRILL Publishing. ISBN 90-04-08390-1, ISBN 978-90-04-08390-5. pg 38–40, 79. ↑ Uradyn Erden Bulag. Hildegard Diemberger. International Association for Tibetan Studies. Seminar, Uradyn Erden Bulag. Brill's Tibetan studies library. (2007). "The Mongolia-Tibet interface: opening new research terrains in Inner Asia": PIATS 2003: Tibetan studies: Proceedings of the Tenth Seminar of the International Association for Tibetan Studies. BRILL Publishing. ISBN 90-04-15521-X, ISBN 9789004155213. ↑ Zhao, Suisheng. (2004). Chinese foreign policy: pragmatism and strategic behavior. M.E. Sharpe publishing. ISBN 0-7656-1284-4, ISBN 978-0-7656-1284-7. pg 207. 1 2 中央研究院. (1993). 近代中國歷史人物論文集. 中央研究院近代史研究所. ISBN 957-671-150-9, ISBN 978-957-671-150-3. 1 2 3 "新疆伊犁辛亥革命打破清王朝西遷夢". Hkcna.hk. Retrieved 2011-10-23. 1 2 3 4 Millward, James A. (2007). Eurasian crossroads: a history of Xinjiang. Columbia University Press ISBN 0-231-13924-1 pg 168, 440. ↑ Andrew D. W. Forbes (1986). Warlords and Muslims in Chinese Central Asia: a political history of Republican Sinkiang 1911–1949. Cambridge, England: CUP Archive. p. 376. ISBN 978-0-521-25514-1 . Retrieved 28 June 2010. ↑ Ondřej Klimeš (8 January 2015). Struggle by the Pen: The Uyghur Discourse of Nation and National Interest, c.1900–1949. BRILL. pp. 83–. ISBN 978-90-04-28809-6. ↑  (2007). Daily report: People's Republic of China, Issues 200–210. National Technical Information Service publishing. Digitized 2 March 2007 by University of Michigan. pg 50. ↑ "人民網-寶島英雄譜-苗栗事件：台灣光復先驅羅福星". Tw.people.com.cn. Retrieved 2011-11-17. 1 2 Dell'Orto, Alessandro. (2002). Place and spirit in Taiwan: Tudi Gong in the stories, strategies, and memories of everyday life. sychology Press. ISBN 0-7007-1568-1, ISBN 978-0-7007-1568-8. pg 39. ↑ Katz, Paul R. Rubinstein, Murray A. (2003). Religion and the formation of Taiwanese identities. Palgrave Macmillan Publishing. ISBN 0-312-23969-6, ISBN 978-0-312-23969-5. pg 56. ↑ Rhoads, Edward J. M.  (2000). Manchus and Han: ethnic relations and political power in late Qing and early republican China, 1861–1928. University of Washington Press. ISBN 0-295-98040-0, ISBN 978-0-295-98040-9. pg 183. ↑ Tung, William L.  (1968). The political institutions of modern China. Springer Publishing. ISBN 90-247-0552-5, ISBN 978-90-247-0552-8. pg 18. 1 2 3 4 Rhoads, Edward J. M.  (2000). Manchus & Han: ethnic relations and political power in late Qing and early republican China, 1861–1928. University of Washington publishing. ISBN 0-295-98040-0, ISBN 978-0-295-98040-9. pg 228. ↑ Pomerantz-Zhang, Linda. (1992). Wu Tingfang (1842–1922): reform and modernization in modern Chinese history. Hong Kong University Press. ISBN 962-209-287-X, 9789622092877. pg 207- 209. ↑ K. S. Liew. (1971). Struggle for democracy: Sung Chiao-jen and the 1911 Chinese revolution. University of California Press. ISBN 0-520-01760-9, ISBN 978-0-520-01760-3. pg 131–136. ↑ Wu Yuzhang. (2001). Recollections of the Revolution of 1911: A Great Democratic Revolution of China. The Minerva Group Publishing. ISBN 0-89875-531-X, 9780898755312. pg 132. 1 2 3 4 李雲漢. (1996). 中國近代史. 三民書局 publishing. ISBN 957-14-0669-4, ISBN 978-957-14-0669-5. ↑ 中央硏究院近代史硏究所. (1971). 中央硏究院近代史硏究所集刊, Volume 2. Digitized on 2 August 2007 from the University of California. ↑ 存萃學社. 周康燮. (1971). 辛亥革命研究論集: 1895–1929, Volume 1. 崇文書店 publishing. Digitized on 16 August 2007 by University of Michigan. ↑ Feng, Youlan Feng. Mair, Denis C.  (2000). The hall of three pines: an account of my life. University of Hawaii Press. ISBN 0-8248-2220-X, 9780824822200. pg 45. ↑ Lane, Roger deWardt. (2008). Encyclopedia Small Silver Coins. ISBN 0-615-24479-3, ISBN 978-0-615-24479-2. 1 2 Welland, Sasah Su-ling. (2007). A Thousand miles of dreams: The journeys of two Chinese sisters. Rowman Littlefield Publishing. ISBN 0-7425-5314-0, ISBN 978-0-7425-5314-9. pg 87. ↑ Yu Weichao Yu. (1997). A Journey into China's Antiquity: Yuan Dynasty, Ming Dynasty, Qing Dynasty. Volume 4. Morning Glory Publishers. ISBN 7-5054-0514-4, ISBN 978-7-5054-0514-1. 1 2 3 Fitzgerald, John. (1998). Awakening China: Politics, Culture, and Class in the Nationalist Revolution. Stanford University Press. ISBN 0-8047-3337-6, ISBN 978-0-8047-3337-3. pg 180. ↑ Hsiao-ting Lin. (2010). Modern China's ethnic frontiers: a journey to the west. Taylor & Francis. ISBN 0-415-58264-4, ISBN 978-0-415-58264-3. pg 7. 1 2 邵建. (2008). 胡適前傳. 秀威資訊科技股份有限公司 publishing. ISBN 986-221-008-7, ISBN 978-986-221-008-6. pg 236. ↑ Boorman, Howard L. Howard, Richard C. Cheng, Joseph K. H.  (1970). Biographical dictionary of Republican China, V. 3. Columbia University Press. ISBN 0-231-08957-0, ISBN 978-0-231-08957-9. ↑ Fu, Zhengyuan. (1993). Autocratic tradition and Chinese politics: Zhengyuan Fu. Cambridge University Press. ISBN 0-521-44228-1, ISBN 978-0-521-44228-2. pg 154. ↑ Hsueh, Chun-tu. Xue, Jundu. (1961). Huang Hsing and the Chinese revolution. Stanford University Press. ISBN 0-8047-0031-1, ISBN 978-0-8047-0031-3. ↑ Fu, Zhengyuan. (1993). Autocratic tradition and Chinese politics. Cambridge University Press. ISBN 0-521-44228-1, ISBN 978-0-521-44228-2. pp 153–154. ↑ Eiko Woodhouse (2 August 2004). The Chinese Hsinhai Revolution: G. E. Morrison and Anglo-Japanese Relations, 1897–1920. Routledge. pp. 113–. ISBN 978-1-134-35242-5. ↑ Jonathan D. Spence (28 October 1982). The Gate of Heavenly Peace: The Chinese and Their Revolution. Penguin Publishing Group. pp. 84–. ISBN 978-1-101-17372-5. ↑ Shêng Hu; Danian Liu (1983). The 1911 Revolution: A Retrospective After 70 Years. New World Press. p. 55. ↑ The National Review, China. 1913. p. 200. ↑ Monumenta Serica. H. Vetch. 1967. p. 67. ↑ Percy Horace Braund Kent (1912). The Passing of the Manchus. E. Arnold. pp. 382–. ↑ M.A. Aldrich (1 March 2008). The Search for a Vanishing Beijing: A Guide to China's Capital Through the Ages. Hong Kong University Press. pp. 176–. ISBN 978-962-209-777-3. ↑ Modernisation of Chinese Culture: Continuity and Change (revised ed.). Cambridge Scholars Publishing. 2014. p. 74. ISBN 978-1443867726. ↑ "AMERICA NOT A CHRISTIAN NATION, SAYS DR. PENTECOST" (PDF). The New York Times. 11 February 1912. Archived from the original on 25 March 2014. ↑ "Sun Yatsen and the Xinhai Revolution". Sinica. 13 October 2011. Retrieved 14 March 2017. 1 2 Rhoads, Edward J. M.  (2000). Manchus & Han: ethnic relations and political power in late Qing and early republican China, 1861–1928. University of Washington publishing. ISBN 0-295-98040-0, ISBN 978-0-295-98040-9. p. 266. ↑ Ulrich Theobald (28 September 2011). "Chinese Literature – Man-Qing yeshi 滿淸野史". www.chinaknowledge.de. Retrieved 2011-11-17. ↑ Tanner, Harold M.  (2010). "China: From the Great Qing Empire through the People's Republic of China 1644–2009" Volume 2 of China: A History. Hackett Publishing. ISBN 1-60384-204-7, ISBN 978-1-60384-204-4. pg 123. ↑ Lague, David (16 March 2007). "China's Manchu speakers struggle to save language". The New York Times. Retrieved 2011-11-17. ↑ Fenby, Jonathan. (2008). The History of Modern China: The Fall and Rise of a Great Power. ISBN 978-0-7139-9832-0. pg 143. 1 2 South China morning post. Sun Yat-sen and the centenary of the Xinhai revolution. 4 July 2010. 1 2 Yan, Jiaqi Yan. Hong, David S. K. Mair, Denis C.  (1992). Toward a democratic China: the intellectual autobiography of Yan Jiaqi. University of Hawaii press. ISBN 0-8248-1501-7, ISBN 978-0-8248-1501-1. pg 189, 251. ↑ Yang, Mayfair Mei-hui. (1994). Gifts, favors, and banquets: the art of social relationships in China. Cornell University Press. ISBN 0-8014-9592-X, 9780801495922. Pg 146–147. ↑ Luo, Yadong. (2007). Guanxi and business. Volume 5 of Asia-Pacific business series. World Scientific. ISBN 981-270-046-3, ISBN 978-981-270-046-9. pg 26. ↑ 陸韻葭. (2006). 上海玩全指南. Travelcom press. ISBN 986-7143-13-2, ISBN 978-986-7143-13-6. pg 49. 1 2 3 4 5 South China morning post. 29 March 2011. Replacing chairman Mao with Sun Yat-sen.
↑ Takungpao.com. "1911". Takungpao.com. Retrieved 2011-11-17. ↑ 1059 (19 September 2011). "劉少奇談辛亥革命（摘要）-中國共產黨新聞". Dangshi.people.com.cn. Retrieved 2011-11-17. ↑ "王志昆講重慶辛亥革命：為什麼兵不血刃，一次成功_重慶_重慶站_鳳凰網". Big5.ifeng.com. 30 December 2008. Retrieved 2011-11-17. ↑ 章, 士釗 (2000) . "孫、黃遺劄密詮". 章士釗全集. 8. 上海: 文彙出版社. p. 341. ISBN 978-7805315430. ↑ Pomfret, James (27 June 2011). "China's Wen calls for greater democracy, reforms". Reuters. Retrieved 2011-11-17. ↑ The Yomiuri Shimbun (14 October 2011). "100 years on, China far from democracy: Editorial: DAILY YOMIURI ONLINE (The Daily Yomiuri)". Yomiuri.co.jp. Retrieved 2011-11-17. 1 2 "China grapples with revolutionary past, 100 years on". GEO.tv. Retrieved 2011-11-17. 1 2 "Democracy Activist Qin Yongmin Released from Prison after 12-Year Sentence | Human Rights in China 中国人权". Hrichina.org. 29 November 2010. Retrieved 2011-11-17. ↑ "China grapples with revolutionary past, 100 years on". The West Australian. Au.news.yahoo.com. 9 October 2011. Retrieved 2011-11-17. Wu Xinghan (Chinese :吳醒漢), Three Day Journal of Wuchang Uprising (Chinese :武昌起義三日記). Esherick, Joseph W. (1976). Reform and revolution in China: the 1911 revolution in Hunan and Hubei. Berkeley: University of California Press. ISBN 978-0-520-03084-8. Shinkichi, / edited Eto; Schiffrin, Harold Z. (1994). China's republican revolution. [Tokyo]: University of Tokyo Press. ISBN 978-4-13-027030-4. Fung, Edmund S. K. (1980). The military dimension of the Chinese revolution: The New Army and its role in the revolution of 1911. Vancouver: University of British Columbia Press. ISBN 978-0-7748-0129-4. Goldstein, Melvyn C. (1991). A History of Modern Tibet, 1913–1951: The Demise of the Lamaist state. University of California Press. ISBN 978-0-520-07590-0. Ma, L. Eve Armentrout (1990). Revolutionaries, monarchists, and Chinatowns: Chinese politics in the Americas and the 1911 revolution. Honolulu: University of Hawaii Press. ISBN 978-0-8248-1239-3. Rankin, Mary Backus (1986). Elite activism and political transformation in China: Zhejiang Province, 1865–1911. Stanford, Calif.: Stanford University Press. ISBN 978-0-8047-1321-4. Wright, Mary Clabaugh (1978). China in revolution: the first phase 1900–1913 (4. printing. ed.). New Haven [u.a. ]: Yale University Press. ISBN 978-0-300-01460-0. Hsieh, Winston (1975). Chinese historiography on the Revolution of 1911: a critical survey and a selected bibliography. Stanford, Calif.: Hoover Institution Press, Stanford University. ISBN 978-0-8179-3341-8. Young, Ernest P. (1977). The Presidency of Yuan Shih-K'ai: Liberalism and Dictatorship in Early Republican China. Ann Arbor: University of Michigan Press, Michigan Studies on China. Kaplan, Lawrence M. (2010). Homer Lea: American Soldier of Fortune. Lexington. : University Press of Kentucky. ISBN 978-0-8131-2616-6. Tang (唐), Degang (德剛) (1998). The Late 50 years of Qing: Yuan Shikai, Sun Yat-sen and Xinhai Revolution. Taipei: Yuanliu (遠流). ISBN 978-957-32-3513-2. Tang (唐), Degang (德剛) (2002). 袁氏當國[The Rule of Yuan Shikai]. Taipei: Yuanliu (遠流). ISBN 978-957-32-4680-0. Zhang (張), Yufa (玉法) (1998). 中華民國史稿[The History of the Republic of China]. Taipei: Lianjin (聯經). ISBN 978-957-08-1826-0. Lin (林), Yusheng (毓生) (1983). <五四時代的激烈反傳統思想與中國自由主義的前途> 收入"思想與人物"[The Anti-tradition Trends of May Forth Era and the Future of Libertarianism in China included in "Personage and their thoughts"]. Taipei: Lianjin (聯經). ISBN 978-957-08-0384-6. Zhou (周), Weimin (伟民); Tang (唐), Linlin (玲玲) (2002). 中国和马来西亚文化交流史[The History of Cultural Interactions of China and Malaysia]. Haikou: Hainan (海南). ISBN 978-7-5443-0682-9. Li (李), Zehou (澤厚); Liu (劉), Zhaifu (再復) (1999). 告別革命－二十世紀中國對談錄[A Farewell to the Revolutions: Records of Discussions in 20th century China]. Taipei: Maitian (麥田). ISBN 978-957-708-735-5.